One of the biggest challenges with my old DC power system was apparent when away from the dock. Grace has a Yanmar engine with a factory alternator, which on a good day output 30 amps into the battery bank. Not only was this not enough for the new bank, but the regulator was not programmable and would damage my new Firefly batteries. After a bunch of research, I chose Balmar as a complete system. This is the third in a series of posts on my power system upgrade which will cover design, install, and specific implementation challenges. One of the constraints in replacing the alternator was the belt setup and draw it would put on the engine. I wanted to keep a single belt solution due to simplicity. That limited my choices to a max of a 100 amp alternator. 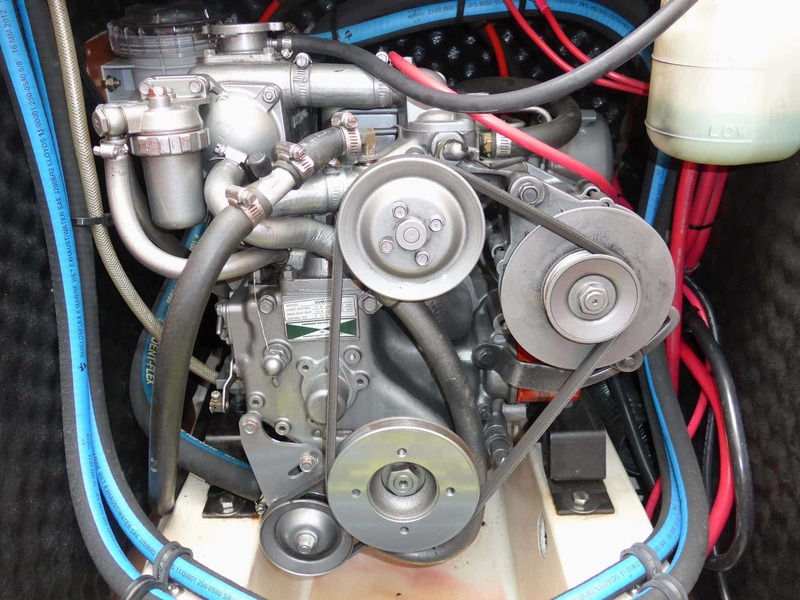 There were other options including replacing pulleys and adding more belts which could have produced more amperage, but I was concerned about the complexity this would add, along with the load on the engine. The old alternator was pretty easy to get off. It had been repainted at some point, making many of the labels unreadable. I took a lot of photographs of the wiring for reference and ensured all of my battery bank and DC supply was completely isolated while removing. The existing positive wire can be seen uncovered in the middle of the picture. It seems undersized to me – I wonder if that is why I never saw more than 25-30 amps of current from the alternator. 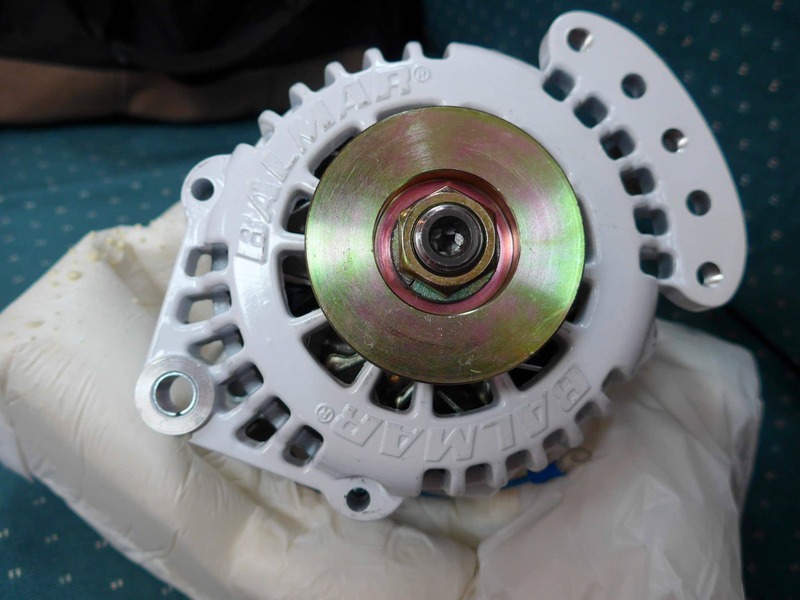 The original alternator was a saddle mount, or dual foot setup. 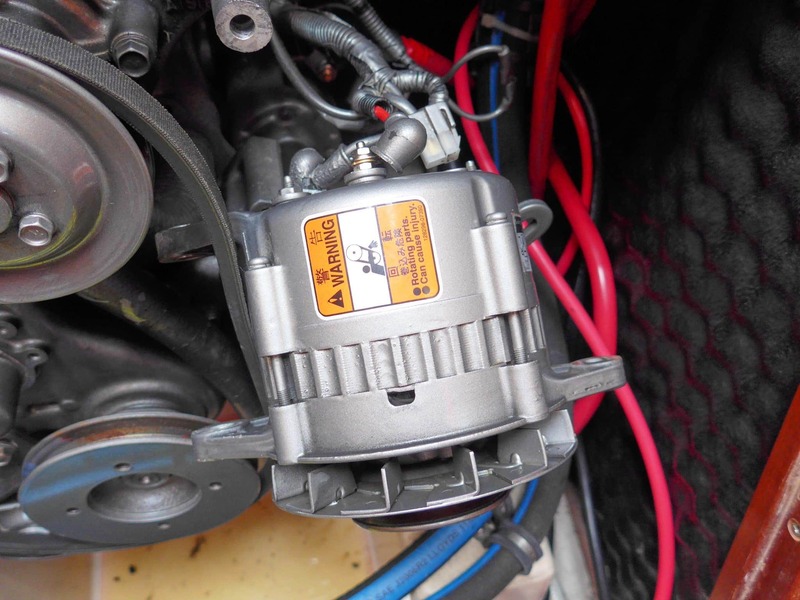 It was easy to use Balmar’s web page configurator to figure out what model of alternator I needed to purchase, but I would recommend confirming by examining your existing one. The mounting on the new one looked like it would fit perfectly. I read and re-read the wiring instructions before reconnecting everything. 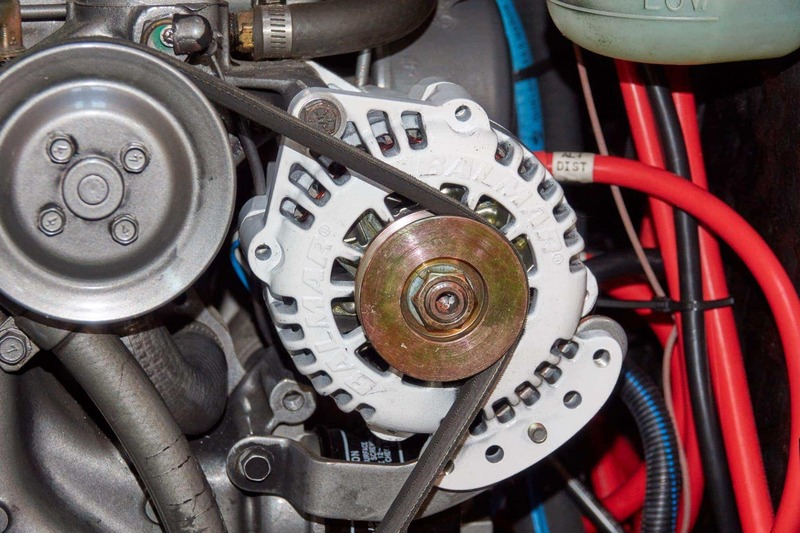 Many of the concepts behind an alternator and the way things are wired are a bit different than your average battery setup. It is important that you wire things exactly as required. 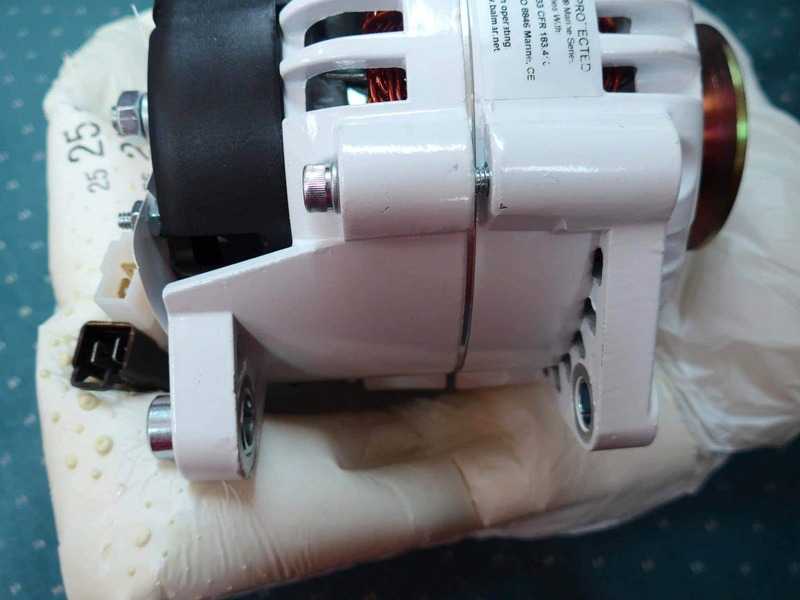 If you don’t feel comfortable, consult an elecrtician – getting any part of this wrong could fry your alternator or damage your batteries, or worse. One of the biggest changes to this setup I covered in the arteries and veins of your electrical system. This included replacing all of the wiring going to and from the alternator with new and much larger wire. This was critical to ensure that the power generated by the alternator makes it to the battery bank as efficiently and safely as possible. Here is the dual foot mounting necessary for my engine. 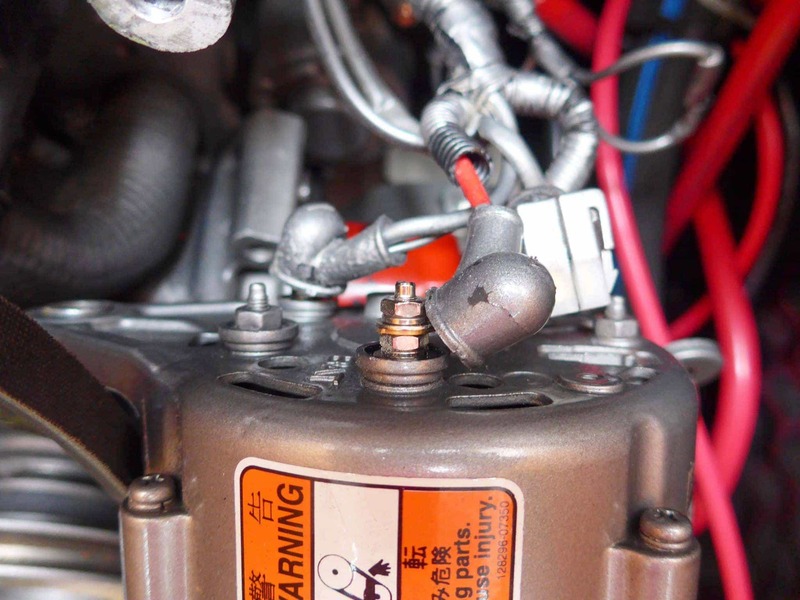 One thing that was very helpful was Balmar’s extremely detailed installation instructions for both the alternator and regulator. Lots of pictures, lots of good diagrams, and a step by step for most scenarios that has clear explanations of why you’re doing something. I wish other manufacturers spent the time to produce such quality install and troubleshooting documentation, and include a printed copy with something like this – I know I referred to them at least a bazillion times while double and triple checking my wiring. Installing the new alternator was very easy compared to most boat-related projects. I did have to acquire a new, longer bolt from my local supply store as the new foot was a bit thicker on the rear of the unit. 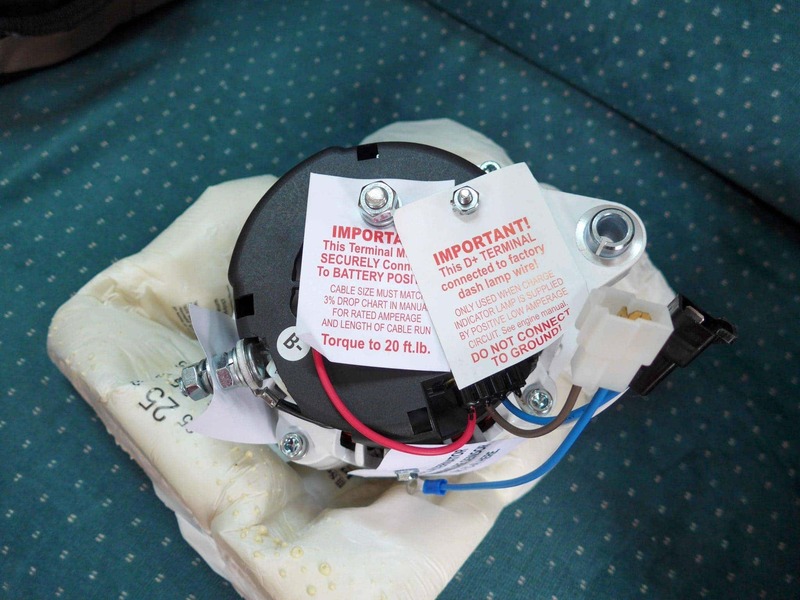 Once installed, I tensioned the belt per the manufacturers instructions, reconnected all the wiring, and was ready to install the regulator. The regulator was a bit more complicated to install, mainly because of the amount of connections. Besides the standard connections, I also added battery and alternator temperature sensors. I felt this was necessary to make the system as safe and thorough as possible. 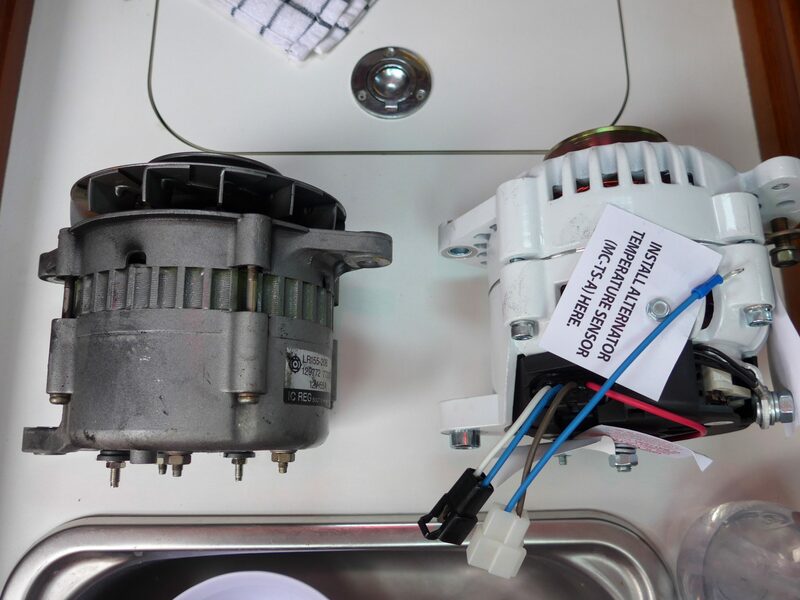 The battery temp sensor ensures that the system isn’t overcharging the batteries or charging them too fast, and the alternator temp sensor ensures the alternator isn’t working too hard. Given how hot the engine room can get, both of these will help in preventing damage. When it came to programming the regulator, I chose to create a custom profile that matches the Firefly batteries requirements. I also setup a delayed startup time of 60 seconds for the alternator – allowing the engine to start and warm up a bit before the alternator starts charging heavily. I may increase this to prevent such a big load from occurring so quickly after starting. I forgot to document all of the bits and pieces to the exact program but will do so in a future post. I did a lot of testing to ensure there were no wiring issues or problems – metering out various spots and ensuring the connections behaved the exact way the instructions indicated. Then I tested charging with the battery bank at mostly full capacity and was happy with the measured voltages at the right places. After discharging the battery bank for a few hours, a load test showed over 90 amps of continuous power being generated by the alternator into the bank. Note that in the pic above, the shunt was configured backwards, showing a negative value. In addition, there was about 6 amps of load on the system. 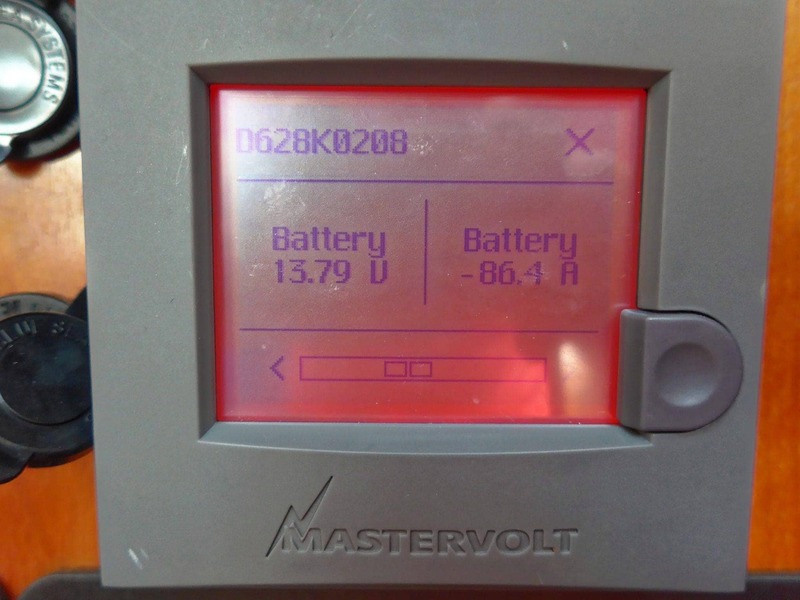 In continued testing and usage for the last few months, I’ve seen consistent charging voltages and really good amperage amounts that make a huge difference in topping off the battery bank while away from the dock. I’ve noticed a moderate amount of dusting from the belt, and believe this is because of tensioning, but will continue to monitor. Some might consider this part of the power project to be optional, at least the alternator. For sure you will need a better regulator if you choose to use Firefly batteries, or you will damage them / reduce their life. 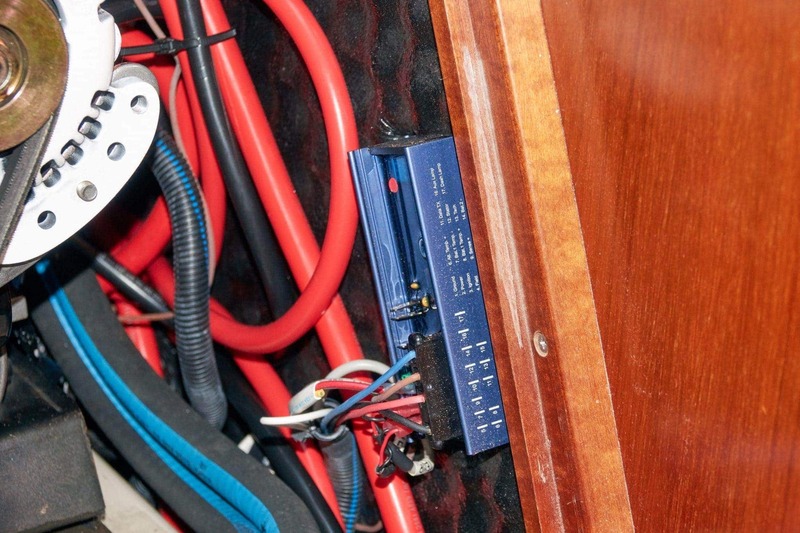 I consider the alternator just as important so that I can charge the bank back up as fast as possible while away from the dock, and ultimately spend more time out on the water! Amazon Echo is perfect for the sailboat. The number one use is choosing what music to listen to, which is important for the crew. In addition, quick access to various news and fact sources comes in handy while on the water.